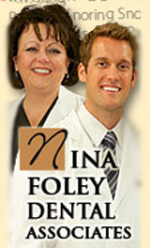 Nina Foley Dental Associates: Announces Expansion and Move! Nina Foley Dental Associates, located on Hillsboro Road in the Grassland area, has announced two exciting new developments. Dr. Foley will be moving to a larger, state-of-the-artfacility in January 2013 to care for her patients in a more private and comfortable atmosphere. The new facility will be conveniently located at 5005 Meridian Blvd. in Franklin, off the Cool Springs Blvd. and I-65 exit. Secondly, Dr. Foley’s extensive search for a talented and caring dentist to expand her service with has ended as she welcomes Ryan M. Jones, DDS to her practice. Dr. Jones is a Brentwood High graduate and holds a B.A. in Economics from the University of Tennessee, Knoxville. He earned his dental degree from the University of Tennessee, Memphis, graduating among the top of his class. Like Dr. Foley, he is passionate about the art and the science of dentistry and helping patients achieve optimal dental health. The new facility, coupled with the addition of Dr. Jones will allow Nina Foley Dental Associates to extend their hours and expand their services to benefit both current and new patients. to be the most comfortable you can be. Dr. Foley practices what’s becoming known as “Spa Dentistry,” making you feel like you’re anywhere but the dentist’s office. Nina Foley Dental Associates will pamper you so you can relax and enjoy your visit to their clean and safe practice, while providing you with a refreshingly different dental experience. In addition, Dr. Foley and Dr. Jones use the latest dental technologies and techniques to make your treatment as effective and comfortable as possible, including Buffered Injections which reduces the “sting” at injection sites; the Diagnodent , a laser enable detection aid which allows the doctors to use minimally invasive treatments to diagnose cavities; the Intraoral Camera, an additional method to view teeth without the constraints of a mirror; and “The Wand,” a computer controlled anesthetic delivery system that allows the doctors precise control and delivery of local anesthesia. Dr. Foley has also been specially trained in the Invisalign tooth straightening system, which is growing in popularity among patients of all ages.